IS FAT GOOD FOR US OR BAD? YES! (1) UNSATURATED FAT: Love it! There are two kinds of unsaturated fat — polyunsaturated and monounsaturated. Dietary fats and oils usually contain a mixture of polyunsaturated, monounsaturated and saturated fats. Fats and oils with higher amounts of unsaturated fat are typically liquid at room temperature and start to turn solid when chilled. Corn oil is an example of a primarily polyunsaturated fat, and olive oil is an example of a primarily monounsaturated fat. Unsaturated fats can help reduce bad (LDL) cholesterol and triglyceride levels in your blood and lower your risk of heart disease and stroke. They also provide nutrients to help develop and maintain your body’s cells. Oils rich in unsaturated fats provide vitamin E, an antioxidant vitamin most of us need more of. Polyunsaturated fat also provides essential omega-6 and omega-3 fatty acids that your body needs but can’t produce on its own. These you must get through food. Omega-6 and omega-3 fatty acids are important for many functions in your body and brain. 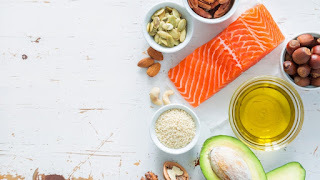 Unsaturated fats are mainly found in these foods: liquid vegetable oils such as canola, corn, olive, peanut, safflower, soybean and sunflower; nuts such as almonds, cashews, hazelnuts, peanuts, pecans, pistachios and walnuts; fish such as salmon, trout and herring; and avocados. Avocados are a delicious and colorful way to add unsaturated fat to a meal and are very versatile. The American Heart Association recommends replacing bad (saturated) fats with good (unsaturated) fats as part of a healthy eating plan. (2) SATURATED FAT: Limit it! Saturated fat is typically solid at room temperature, like butter or cheese or the fat on beef. Most saturated fat comes from animal products such as lard, fatty beef, lamb, pork, poultry with skin, butter, cream, cheese and other dairy products made from whole or 2 percent milk. Saturated fat increases bad (LDL) cholesterol. Your liver produces more cholesterol when you eat a diet high in sat fat — not a good thing. For people who need to lower their cholesterol, the American Heart Association recommends reducing saturated fat to no more than 5 percent to 6 percent of total daily calories. For example, a person on a 2,000-calorie-a-day eating plan should eat no more than 120 calories or 13 grams of saturated fat per day. (3) TRANS FAT: Lose it! Artificial trans fats (or trans fatty acids) do not occur naturally. They are manufactured by adding hydrogen to liquid vegetable oils in an industrial process that makes the oil more solid. Partially hydrogenated oils are the primary dietary source of artificially-produced trans fat. Trans fat is found in many commercially fried foods and baked goods such as doughnuts, pastries, pizza dough, cakes, pie crust, cookies, crackers, as well as stick margarines and other spreads. For many years, trans fat was a boon for food manufacturers because it is easy to use, inexpensive to produce, and lasts a long time, which increases the shelf life of products. It also can alter a food’s taste and texture. Many restaurants and fast-food outlets have used oils with trans fat to deep-fry foods because it can be used over and over in commercial fryers. Trans fat became controversial in the 1990s when researchers found evidence that it had adverse health effects. Trans fat raises bad (LDL) cholesterol levels, increasing the risk of heart disease. Trans fat is also associated with a higher risk of developing Type 2 diabetes. In June 2015, the FDA announced their determination that partially hydrogenated oils (PHOs) are no longer “generally recognized as safe” in human food. This means there is no safe level that can be consumed. Food manufacturers were given three years to remove PHOs from products. Many companies have been working to remove them more quickly. The American Heart Association recommends avoiding artificial trans fat and PHOs in your diet. · Replace saturated and trans fats with unsaturated fats as part of a healthy eating pattern. · When eating out, ask what kind of fat or oil foods are cooked in. Request unsaturated fats when possible. · Choose healthier, mostly unsaturated vegetable oils for cooking and preparing foods at home. · If you eat meat, choose lean and extra-lean cuts and remove visible fat and poultry skin. · Use healthier cooking methods that don’t add saturated fat, like roasting, grilling, steaming or baking. · Choose fat-free (skim) or low-fat (1%) milk, yogurt and dairy products. 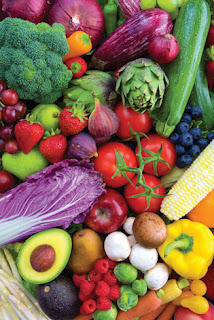 The AHA’s healthy eating recommendations emphasize eating more servings of fruit and veggies. An easy way to do that is to add color to your plate. Look at your meal. If it looks a bit too beige, you may be eating foods with a lot of saturated fat. You can improve it by adding some colorful fruit and veggies. Jazz up rice and pasta with some frozen veggies. Add plenty of vegetables to soups. Add color to casseroles by sneaking some shredded fruit or vegetables into the recipe. Omit the meat and double the veg for a meatless stir-fry. Stack sandwiches and burgers with avocado, tomato and other sliced fruits and veggies. And it’s good for your budget: many fruits and vegetables are less than $1 a serving, and you can often buy in bulk in season and freeze for later use. A piece of fruit is a healthy snack and almost always cheaper than anything from a vending machine.